This product comes in many varieties including American, Asian, Chinese/Korean or Siberian and has been used in the East for many centuries. In fact it is one of the oldest known herbal medicines. Both Chinese/Korean and American is a variety of panax ginseng where as Siberian comes from an entirely different plant and so perform different functions. Generally the active part of the plant is the root and depending on type the root is either dried in the air, or by steaming and then drying. They are sometimes called adaptogenic herbs as they may help you react to physical or emotional stress and fatigue by its action on the adrenal glands. 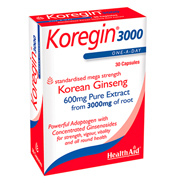 Korean Ginseng is regarded as the most potent Ginseng available. 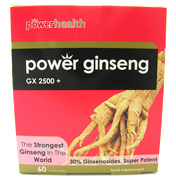 Ginseng has many applications however is said to promote Yang energy, improves circulation, increases blood supply, revitalizes and aids recovery from weakness after illness and stimulates the body. It is also prized as an aphrodisiac! One of the most widely known brands is Red Kooga and they have now expanded their range to include combination products such as those combined with minerals, Gingko and multivitamins. Levels of active ingredients are listed as ginsenosides (of which there around 30) and generally these are available for review under nutritional information on the product packaging. If in doubt try to seek out a product that contains a standardised extract.